Relive the experiences of those involved in one of the most extraordinary chapters in the history of the Second World War: the desert war fought in North Africa, 1940-42. From Wavell’s Offensive against the Italians in 1940, through the battles with Rommel’s Afrika Corps to the great British success at Alamein, a series of first-hand accounts brings to life the noise and smoke of battle; along with the vagaries of desert life; rest and recreation in Cairo and Alexandra; the development of the Long Range Desert Group and the SAS; and the role of Commonwealth forces in the ultimate Allied victory. Through careful chosen extracts from memoirs, diaries, letters and interviews we hear the authentic voice of men at war. Over 100 photographs, drawings and paintings provide a closely integrated pictorial commentary to the text. 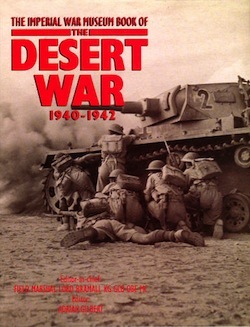 The Desert War was one of a series of books, published in conjunction with the Imperial War Museum, that won a special Duke of Westminster’s Medal for Military Literature.